In previous article about Load-Balancers, we saw the three basic scenarios you can encounter. In this tutorial, let me show you a real life example of Cisco Application Control Engine (ACE) implementation, that is powerful enough to provide leveraged (multiple customers virtualized) load-balancing services with redundancy possibilities scalable to be used in sister data center pairs. Cisco ACE is a powerful Load-Balancer module for Cisco Catalyst 6500 switches or Cisco 7600 routers. If you have already seen or had the privilege to work with a Cisco ACE, you know that it is a powerful little beast that costs a lot of money. Most of us know the basic concepts of Load-Balancers by now from my previous article here. In summary you have the one-arm, two-arm and direct server response architectures. 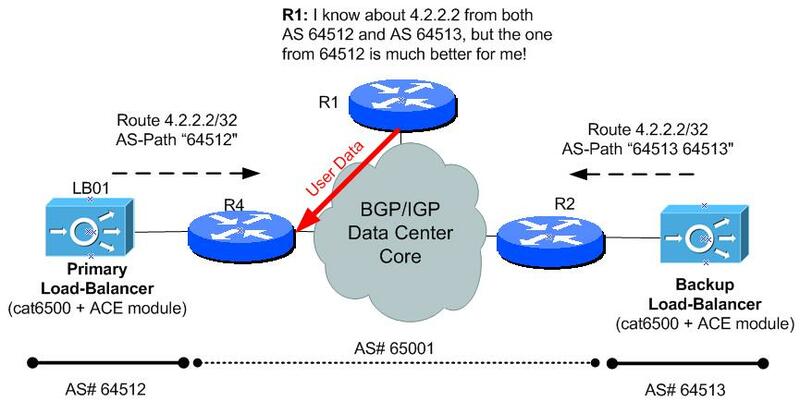 In this example, I will show you how to configure an One-Arm scenario on Cisco ACE with support of customer virtualization and also redundancy between two separate Cisco catalyst 6500 (ACE module in each) by using injection of virtual load-balanced IPs to IGP protocol with different metrics. The configuration example I would like to present to you here is aiming at larger data centers. I personally know about one sister data center pair that definitively uses this solution. The nicest thing about this solution is that the components can be physically very distant without the need of creating L2 broadcast domain between for example two distant data centers. All the load-balanced IPs and physical servers can be several L3 hops away thanks to the fact that the “Primary Load-Balancer” is the one that redistributes the load-balanced IP as /32 network to the any routing protocol you like (IGP or BGP). To be exact, both primary and backup Load-Balancer announce /32 network, only that the backup announces a worse metric to this /32 network. Additionally, both Load-Balancers have “probes” configured that are periodically verifying connectivity to all the physical server and if all the servers will stop responding to probes, /32 route is withdrawn. This critical feature to have because if only the connectivity between primary Load-Balancer and the servers would fail, the primary Load-Balancer has to stop sending the /32 route to the load-balanced IP so that the backup Load-Balancer route can win the election process in the routing protocol. If you had a look at the topology I am showing you above, you can notice that we have a full data center core shown in the diagram. This is simply to represent the fact that you can use this configuration examples here if you have the two Load-Balancers separated by many L3 hops away. Of course nobody is preventing you to connected them to the same switch in one rack, it does not matter to the configuration of the Load-Balancer much. However, this design is aimed to allow you elegant physical redundancy your Load-Balancers in two physical locations. Many big data centers exist in pairs. This is to provide redundancy if one data center either loose power, or is for some reason destoryed (fire, or other catastrophe), its sister data center takes over. With Load-Balancers design allowing you to have L3 hop distance and cooperation with routing protocols between Load-Balancers, the connection between two data centers do not need L2 broadcast domain spanning all the way through the data center to connect two Load-Balancers. Overall, this design is very clean, easy to understand and powerful enough to be deployed in data center sister pair without any special modifications to the existing network as long as there is any routing protocol connecting the two sister data centers. Enables routes injection into IGP protocols for virtual load-balanced IPs based on probing physical servers! Cisco ACE comes with limitations based on bought license. Without extra cost license, you are for example limited to 5 virtualization contexts and 8Gbps throughput. But licenses are beyond the scope of this article. To configure the ACE load-balancers and the catalyst 6500 switches, all these steps must be completed. You must understand this configuration, let me first present you the “logical” connectivity between the catalyst 6500 supervisor backplane and the ACE module. The ACE module is locally a stand-alone device and you must explicitly create access to the VLANs that you require on the catalyst 6500 supervisor. If you look at the following picture, you can see the two logical VLAN connections that we have to create in our configuration. As presented by using the blue and red color, we need to create access for the direct management traffic to the ACE (you can omit this step if you always want to access the ACE console via the 6500 switch console) and as this is a One-Arm configuration, we need at least one additional VLAN that we will use for user traffic to the virtual context we create on the ACE module. NOTE: To find your ACE module number, you can use “show modules” and you will find your ACE module there with the slot_number. In our topology, this slot_number is 2. We created vlan-group 100 and assigned all three VLANs to this group. We also specified the command “svclc multiple-vlan-interfaces” that enables our ACE to create SVI interfaces for every VLAN we want to have access to in the ACE. Now we need to get into the ACE console to configure it. As you realize, the ACE doesn’t have an IP by default that we can connect to, nor a separate console connector. Therefore we will jump to the ACE CLI via the catalyst 6500 supervisor CLI. To jump from catalyst 6500 supervisor CLI directly to the ACE CLI, use this command. You are now successfully inside the ACE configuration CLI and I advise you to change your password and create username/password to use for the ACE and/or other AAA security options that you require that are not part of this design example. I do not want to go into much details at this point, but to have a template to allow telent/ssh/icmp to the management access via VLAN 2906, you can use this configuration with username admin. At this point you have basic ACE configuration finished and we have VLAN access from the 6500 catalyst backuplane. The last thing to configure in the main ACE configuration is the virtual context creation for our “Customer 1” and his WWW servers. There are only two parts of configuring ACE context, resource limits and the context itself with vlan assigments. There is lot of theory behind doing resource limiting to your customers. Below is a fully working example that gives equal access to resources to all the context configured in the future and the one we created today. For purposes of this example, only basic resource limiting configuration is shown. The shown configuration is in general “all” giving no minimum or maximum limits. For buffers and stickiness* there are minimum resources allocated to this context of 5 and 10 percent and maximum limit is giving equal access to resources compared to all other context that might exist on this ACE. Second part is creating the context that we called CTX_CUSTOMER1, allocated both 2908 and 2927 vlans and assigns our RSRC_CUSTOMER1_LIMITS resource-class. Now that we have the context created, we can change to this context with the “changeto” command. 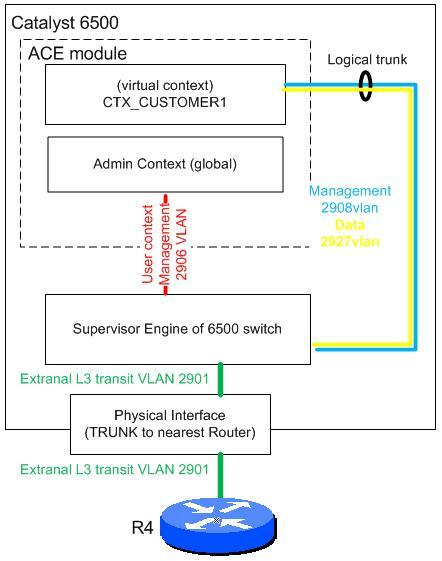 Configuring the CTX_CUSTOMER1 will start first with creating the management access exactly the same way as for the ACE itself and interfaces on the VLAN 2908 and 2927. We are going to have two WWW servers in our load-balancing configuration that we want to constatntly track if they are reachable. Reachability testing is done with probes that we configure to verify http and icmp protocol at the same time. request method get url /cs/images/ACE.html !<— YOU CAN SPECIFY THE URL! NOTE: passdetect interval and passdetect count is used after your server has already failed and this is the probe interval and number of retries that will be sent to a failed server to see if the server is back online by any chance. The HTTP probe is build in capability of the ACE that you can directly verify HTTP service by creating HTTP request for the WWW servers and expect success http code 200 as a response. Both probes are testing reachability every 10 seconds and if the probes fail two consecutive tests, the server is considered down. To configure physical servers defined by their IPs, we use this configuration shown. The “inservice” command is used to indicate it the server should be used (a bit like “no shutdown” for interfaces). If you ever need to remove one physical server temporary, you can just go to this configuration and remove the “inservice” command. This is useful then a physical server is going over maintenance period and you do not want to have many failures detected by the probes and small outages for the clients. Now we need to bind the physical servers to a server-farm. Server-farm reference will be later used by the load-balancing configuration. The rule is that physical server can be included in multiple server-farms! This flexibility can be used if you have different services running on different bunch of server. For example if you have three servers S1,S2 and S3 while S1 and S2 run WWW service and at the same time S2 and S3 run FTP service. Then you can add S1 and S2 into one server-farm and S2 and S3 include into another server-farm. To give you super-quick configuration example of the Load-Balancing configuration, I will leave most of the configuration options on default and only show you the self-explanatory configuration that binds together the L7 class map CMAP_CUST1_WWW, with default L4 class-map “class-default” into the policy maps for loadbalancing “type loadbalance” and finally to the policy-map SLB_CUST1_LB that we can apply to the interface. As you hopefully remember from previous blogpost, for One-Arm configuration, you need to do source NAT as well. The destination NAT is happening already nativelly from the load-balancer configuration, but the source NAT we need to add two commands. With this configuration, all the request will go to the physical servers from source IP of 4.2.2.2 (you can configure different if you like). NOTE: If your Primary Load-Balancer, physical servers and clients are on one switch, or you have some form of routing already created to the 4.2.2.2 virtual IP, then after this point, your service to the clients can already be functional. Now we have complete example of configuration of the Primary Load-Balancer behind us. Now comes the part where we will communicate the /32 virtual load-balanced IPs networks from both Primary and Backup Load-Balancers into the catalyst 6500 supervisor and then into the routing-protocol. The “active” is optional keyword that tells the ACE to only propagate this vip (virtual IP) /32 route only if at least one of the physical servers in the server-farm is considered operational (probes successful and server “inservice”). If we look at the catalyst 6500 routing table, we can see the route to the 4.2.2.2 now. Now that we have the route “pseudo-dynamically” in the catalyst 6500 routing table, we can communicate this route into the routing protocol. The whole point in using BGP with is that we have quite a nice control over the parameters so we can make sure the Primary Load-Balancer wins the selection. 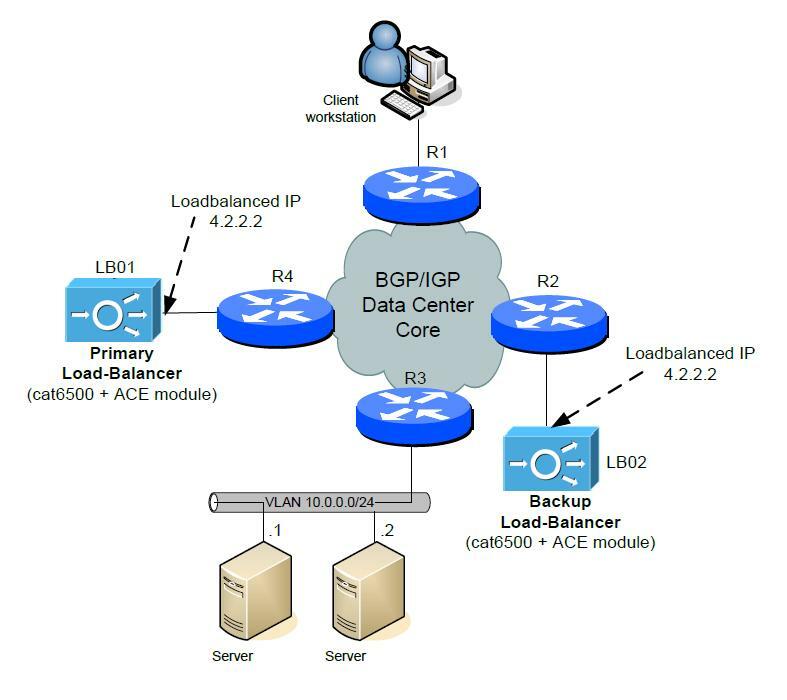 In our example, we configure custom BGP AS numbers for both Load-Balancers so that the connection from the catalyst 6500s to the core routers will be eBGP session. As I hope you understand the basics of BGP at this point. The next diagram shows how the user traffic will be routed to the Primary Load-Balancer. * 4.2.2.2/32 <Backup LB> 0 64513 64513 ? *> <Primary LB> 0 64512 ? Therefore until Primary Load-Balancer is operational and at least one of the probes to the physical servers is successfull, the whole core will choose the route to the 4.2.2.2/32 load-balanced IP using the Primary Load-Balancer. NOTE: Alternative solution can be to have both load-balancers in the same BGP AS as the core routers (bacause the 6500 is probably in your core AS anyway). Then you can use only “redistribute static” in both Primary and Backup Load-Balancers and the core routers will choose based on the IGP costs to the next-hop IP to select the nearest Load-Balancer. The design presented here is redundant because it uses a full combination of redundancy on both Load-Balancers and the inherited redundancy by using multiple physical servers. I personally consider this topology easy to use, clean and you also have a lot of space to expand details in both probes, load-balancing configuration and you can also play with the static route redistribution as well. I hope this article was informative for you. And as always, feel free to comment. Great post! This is extremely helpful as I’m trying to configure a redundant ACE 4710 from a Cisco 3945 router. How can I determine my config was successful? 3) and lastly see if you have sessions in the load-balancer operations by looking at show service policy that you have two sessions (before/after nat) for each incoming user session. This is sweet. Simply the best real time stuff. This is what people expect from experienced people like you.If someone writes an article or a book, one should be able to implement that into their real time production environment after reading the article/book with no difficulty and only then the author is believed to be a top class.Very few can explain the difficult tops better and i believe you are one of them.No information is missing from this completely implementation cycle.Well written. Thank you somuch for your top contribution. I am not expert in this area, but I can appreciate this article as very comprehensive. Thanks for the effort. Do you have a configuration to do the same vip injection in IGP, if you have two sites serving exact contents and each site has its own ace and real servers (different vlan/subnet)? In our production, the serverfarm was identical for both load-balancers just as shown on the first picture. The design presented in this articled doesn’t really care if both the load-balancers are serving the same or separated servers. So if you want separate server groups behind each load-balancers, I do not see a problem doing it that way. Regarding the same configuration with IGP protocol, I do not have something like that prepared, but it shouldn’t be complicated to modify/invent it youself. The VIP is “announced” by ACE as a static route to the local routing table of ACE/catalyst, so you can to similar metric manipulation in other non-BGP protocols behind the “redistribute static” command when putting the VIP route to IGP like OSPF/EIGRP. So you should be able to get similar functionality to my presented BGP scenario if you raise the metric on backup load-balancer during redistribution of VIP route to IGP.